I believe that one of the most important books in the history of economic thought is Philip Mirowski’s Machine Dreams. He explains how the practice of economics, and the status of the economist, dramatically changed in response to the vast sums of money entering the profession around the time of the second world war. Prior to this, economics was a true social science. Figureheads such as Adam Smith were studying political economy and saw their role as a student. Their goal was to understand the world around them, using the lens of economic theory. It was scientific, because it involved a deliberate and coherent method of enquiry. It was akin to sociology, philosophy, or theology. Then, two critical changes generated a revolution. Firstly, government funding of the war effort affected the incentives for academics. Engineering became a national imperative and institutions such as RAND took centre stage. Science started to mean measurement, and if you wanted a slice of the pie you had to behave accordingly. 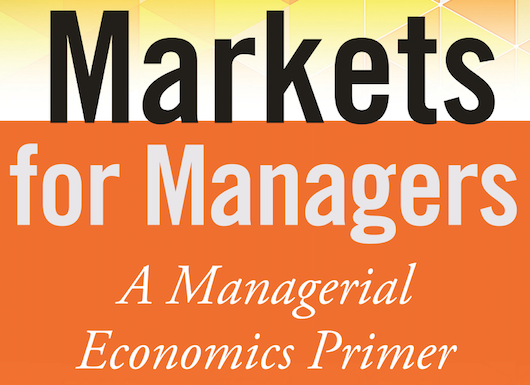 Secondly, John Maynard Keynes provided the tools for economists to engage in policy advice. Not only could economists measure national income, they now had a “General Theory” with which to stimulate it. The experience of the Great Depression dented the reputation of economists, because “laissez-faire” was seen to have failed. Being a mere “student” of misery was no longer an option. But research funding and Keynesian theory gave economists the money and the toolkit to raise their ambitions. As Chris Coyne and Peter Boettke argue economists switched from being students of the economy to saviours. “Political economy” was out and “economics” was in. It morphed into a “hard” science like physics, or mechanics. And as I pointed out in my primer, Markets for Managers, this was when “economists substituted tweed jackets for lab coats”. A few years ago the podcast Serial became a global sensation. It looks at the case of Adnan Syed, who was convicted of murdering his former girlfriend Hae Min Lee back in 1999. It’s success was due, I believe, to reinventing the highly popular “true crime” genre for the internet age. Because it was a podcast it was able to be consumed in two different ways — early adopters could listen each week, and discuss with friends around the water cooler and social media. Then, once it went viral, others were able to binge on multiple episodes and really get into it. It perhaps shouldn’t have been a surprise that the American criminal justice system has many flaws, and that the evidence isn’t always conclusive. But it served to introduce many people to this unsettling fact. Tabloid magazine and trashy cable channels have always found a market for true crime, but the internet age has made it respectable. The Netflix series Making a Murderer proved an even bigger success, delivering a polished and at times thrilling documentary to the insatiable appetite of the box set generation. Of course, it’s been done before. Perhaps the original (and best) example of this type of television is The Thin Blue Line, which is not only a richly told story of a miscarriage of justice, but constitutes evidence in its own right that leads to the acquittal of an innocent man. It came out in 1988, and proves that nothing new is under the sun. However I only became familiar with it on the recommendation of the Netflix algorithm, having watched Making a Murderer. And that served as a launchpad to other classics such as Dreams of a Life, West of Memphis, 3 1/2 Minutes, Cropsey, and Aileen. And that fueled Netflix to commission new documentaries, such as Amanda Knox. In some of these cases, they are simply judicial errors. The audience is drawn in by empathy for the protagonists and shock at how difficult it can be to prove innocence. But the cases I really enjoy are those with some ambiguity. Much of the success of Serial and Making a Murderer is not that it fuels online petition to demand instant pardons, but that reasonable people can disagree on the weight of evidence. They aren’t mere true crime, they are bona fide mysteries. There is a great podcast called Generation Why, hosted by two friends. It is usually an informal affair, where they chat for an hour or so about a particular case. They are informed and bring useful insights, albeit they are amateurs. What I really like about their approach is that they constantly stress that in almost all of these situations, we do not know the answer. Everything is speculation, and this means that we should be humble about the strength of our opinions. …If things go wrong with a puzzle, identifying the culprit is easy: it’s the person who withheld information. Mysteries, though, are a lot murkier: sometimes the information we’ve been given is inadequate, and sometimes we aren’t very smart about making sense of what we’ve been given, and sometimes the question itself cannot be answered. Puzzles come to satisfying conclusions. Mysteries often don’t. I believe that economics shouldn’t be about solving puzzles, it should be about solving mysteries. This has a big implication in terms of the methods we pursue. To solve puzzles we need to acquire new information. In a scientific sense, we might form an hypothesis and test it. We do this by conducting an experiment, or using statistical techniques. This is how most economics is done. But this doesn’t really help us to solve a mystery. We don’t assess Adnan Syed’s guilt by subjecting him to a controlled experiment. We can’t take a sample of similar people and see how they behave in the same situation. Such methods may help, and we can approximate them. But they’re not ideal. How do we solve a mystery? We search for the best explanation. For large, complex, uncertain research questions we can’t really prove or disprove anything. We can just weed out weak explanations in favour of strong ones. The physicist David Deutsch argues that good explanations are ones that are hard to vary. The critical test is one of coherency. 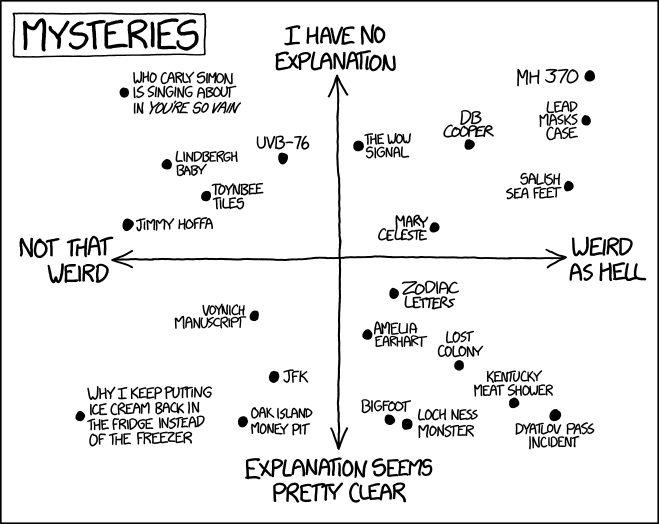 The XKCD graphic below shows a number of mysteries, ranked in terms of how weird they are and whether the author has a good explanation for what happened. My issues with it is that if the explanation seems pretty clear, it isn’t really a mystery. Mysteries should be defined by whether the explanation is clear. But such explanations will always be subjective, and therefore there is room for debate, and learning. The hallmarks of scientific enterprise — Logical positivism, empiricism and experimentation — are not suited to solving mysteries. The increased (and fetishised) mathematisation of the discipline in the twentieth century placed too high a burden on the economists. We are not saviours, and we aren’t hard scientists. But that doesn’t mean we have no insights, or that we aren’t scientists at all.